Mass gatherings such as marathons are increasingly frequent. During mass gatherings, the provision of timely access to health care services is required for the mass-gathering population, as well as for the local community. However, the nature and impact of health care provision during sporting mass gatherings is not well-understood. 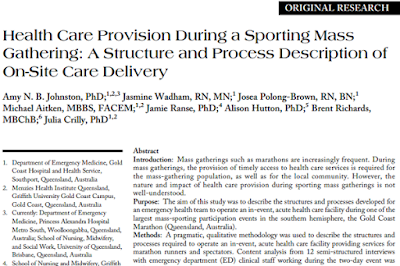 The aim of this study was to describe the structures and processes developed for an emergency health team to operate an in-event, acute health care facility during one of the largest mass-sporting participation events in the southern hemisphere, the Gold Coast Marathon (Queensland, Australia). 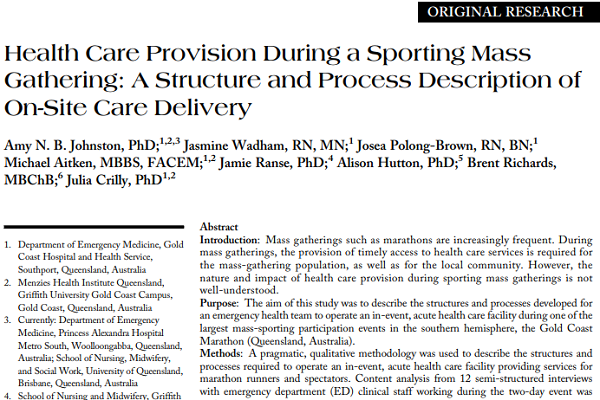 A pragmatic, qualitative methodology was used to describe the structures and processes required to operate an in-event, acute health care facility providing services for marathon runners and spectators. 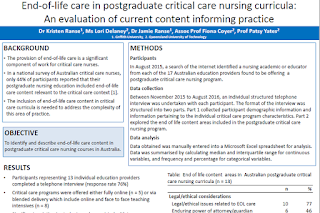 Content analysis from 12 semi-structured interviews with emergency department (ED) clinical staff working during the two-day event was undertaken in 2016. Important structural elements of the in-event health care facility included: physical spaces, such as the clinical zones in the marathon health tent and surrounding area, and access and egress points; and resources such as bilingual staff, senior medical staff, and equipment such as electrocardiograms (ECGs) and intravenous fluids. Process elements of the in-event health care facility included clear communication pathways, as well as inter-professional care coordination and engagement involving shared knowledge of and access to resources, and distinct but overlapping clinical scope between nurses and doctors. 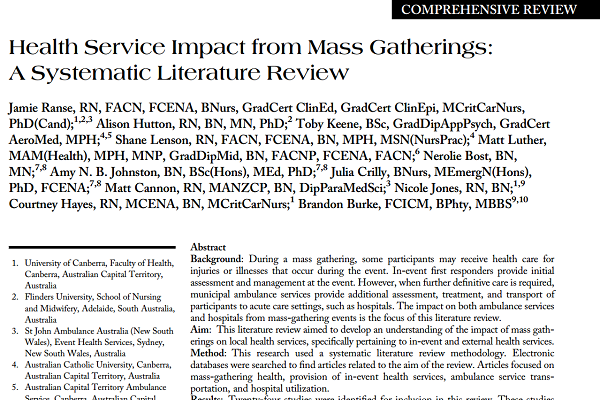 This was seen to be critical for timely care provision and appropriate case management. Staff reported many perceived benefits and opportunities of in-event health care delivery, including ED avoidance and disaster training. This in-event model of emergency care delivery, established in an out-of-hospital location, enabled the delivery of acute health care that could be clearly described and defined. Staff reported satisfaction with their ability to provide a meaningful contribution to hospital avoidance and to the local community. With the number of sporting mass gatherings increasing, this temporary, in-event model of health care provision is one option for event and health care planners to consider. 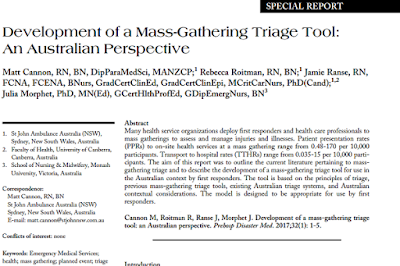 The aim of this study was to describe the in‐event, ambulance and ED impacts of patient presentations from an Australian mass gathering event (MGE) including patient demographics, provision of care, length of stay and discharge disposition. This research was set at one MGE in Australia. The MGE had one first aid post and one in‐event health team staffed by doctors, nurses and paramedics. 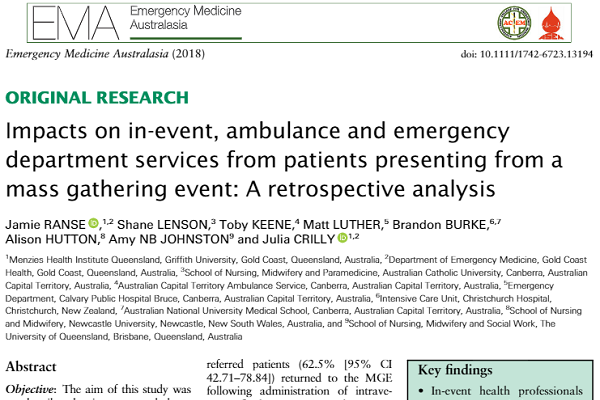 A retrospective analysis of patient care records from providers of in‐event, ambulance and ED services was undertaken. Data analysis included descriptive and inferential statistics. 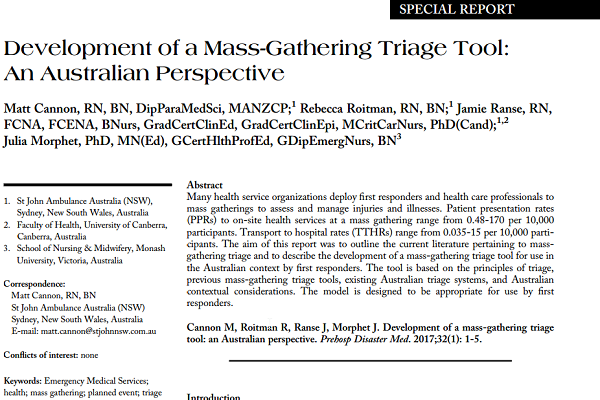 Of the 20 000 MGE participants, 197 (0.99% [95% CI 0.86–1.13], 9.85/1000) presented for in‐event first aid care, with 24/197 (12.2% [95% CI 8.33–17.49], 1.2/1000) referred to in‐event health professionals. Fifteen of the referred patients (62.5% [95% CI 42.71–78.84]) returned to the MGE following administration of intravenous fluids (n = 13) and/or anti‐emetics (n = 11). Seven (29.2% [95% CI 14.92–49.17], 0.35/1000) were referred to ambulance paramedic care, requiring endotracheal intubation (n = 1) and airway adjuncts (n = 3) prior to transportation to ED; these patients had an ED median length of stay of 7 h (5.5–12.5) receiving imaging and ventilator support. Five were discharged from ED, one required an operation and another required intensive care unit admission. 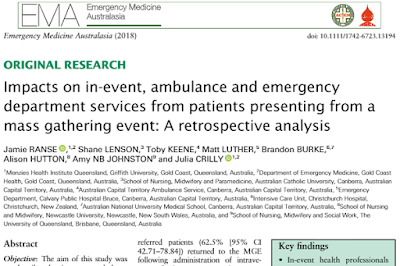 There was an impact on in‐event, ambulance and ED services from this MGE but the in‐event model of care may have limited ambulance usage and ED visits. The ED length of stay was greater than the national median, perhaps reflecting the appropriateness of transport and nature of care requirements while in the ED. 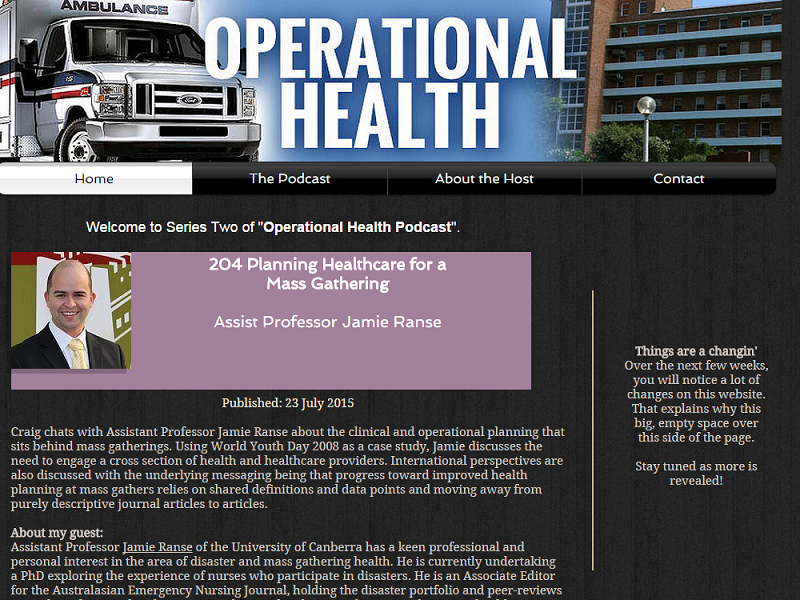 The World Association for Disaster and Emergency Medicine launched a podcast series in 2018. 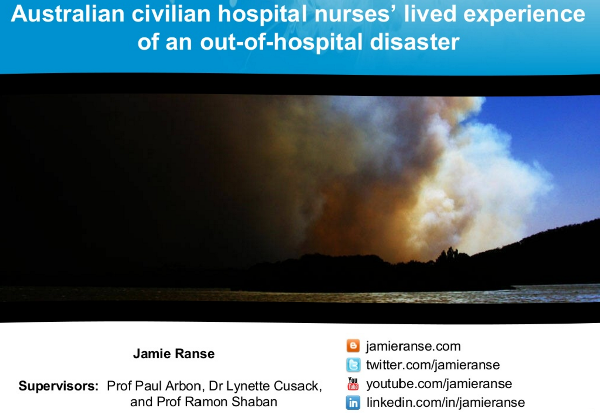 I was invited to speak on the topic of 'Lived-relationships: Experiences of nurses in the out-of-hospital environment following a disaster'. 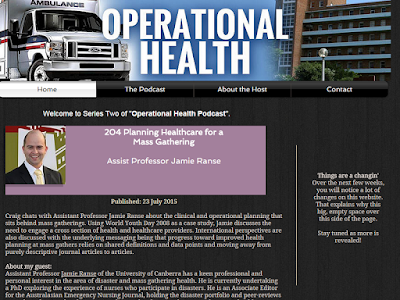 The podcast relates to some of the findings from my Doctoral studies, focusing on the lived-relationships with patients and their families, colleagues, and self. There is a growing body of literature relating to mass-gathering events. 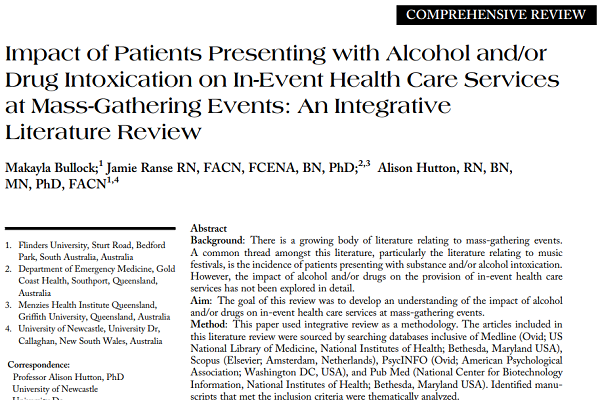 A common thread amongst this literature, particularly the literature relating to music festivals, is the incidence of patients presenting with substance and/or alcohol intoxication. However, the impact of alcohol and/or drugs on the provision of in-event health care services has not been explored in detail. 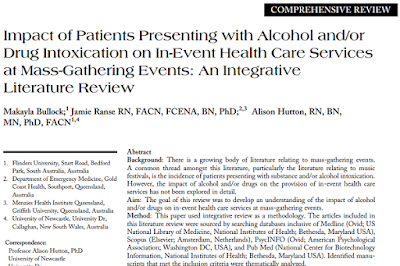 The goal of this review was to develop an understanding of the impact of alcohol and/or drugs on in-event health care services at mass-gathering events. This paper used integrative review as a methodology. 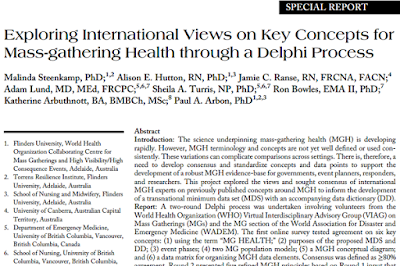 The articles included in this literature review were sourced by searching databases inclusive of Medline (Ovid; US National Library of Medicine, National Institutes of Health; Bethesda, Maryland USA), Scopus (Elsevier; Amsterdam, Netherlands), PsycINFO (Ovid; American Psychological Association; Washington DC, USA), and Pub Med (National Center for Biotechnology Information, National Institutes of Health; Bethesda, Maryland USA). Identified manuscripts that met the inclusion criteria were thematically analyzed. 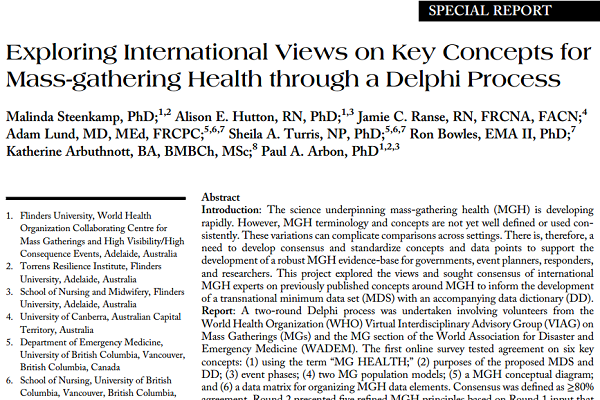 In total, 12 manuscripts met the inclusion criteria for this review. 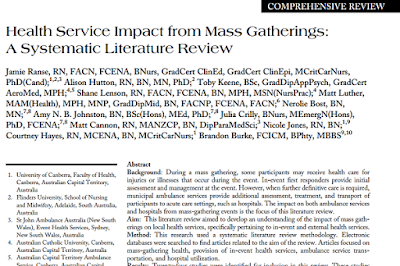 A thematic analysis of these manuscripts identified three main themes: (i) predictive factors, (ii) patient presentation rates, and (iii) levels of care. Substance use and/or intoxication can place a strain on in-event medical services at mass-gathering events. Of the various types of mass-gathering events, music festivals appear to be the most affected by substance use and intoxication. Background: A black system event (BSE) is a large scale black-out where there is a loss of a major power supply. From a health perspective a BSE may disrupt essential equipment within a health service that may be necessary for providing care. 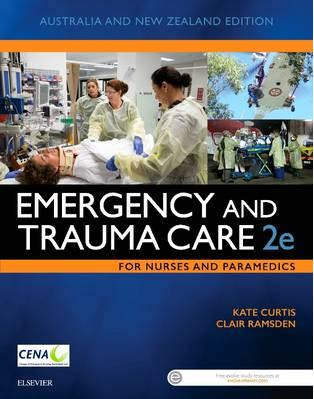 There is a paucity of literature relating to BSE and their impact on emergency departments (EDs). Aim: The research aimed to understand the impact of a BSE on ED clinicians in South Australia. Method: This research used a cross sectional survey design by surveying South Australian ED clinicians who worked during the BSE. Data was collected via a survey with closed and open questions. Quantitative data was analysed using descriptive statistics and qualitative narrative was analysed using a thematic analysis. Results: Surveys were returned from 42 nurses and 7 doctors. The respondents were mostly female and most worked in a metropolitan ED. 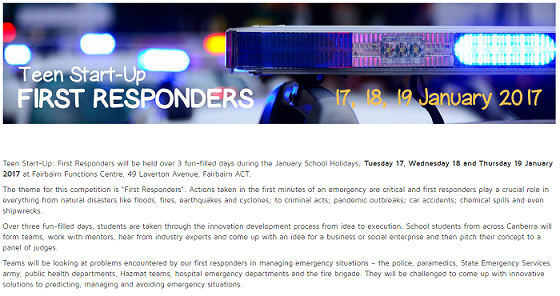 The majority of participants had undertaken some form of disaster education and/or training, despite never been involved in a major incident or disaster. 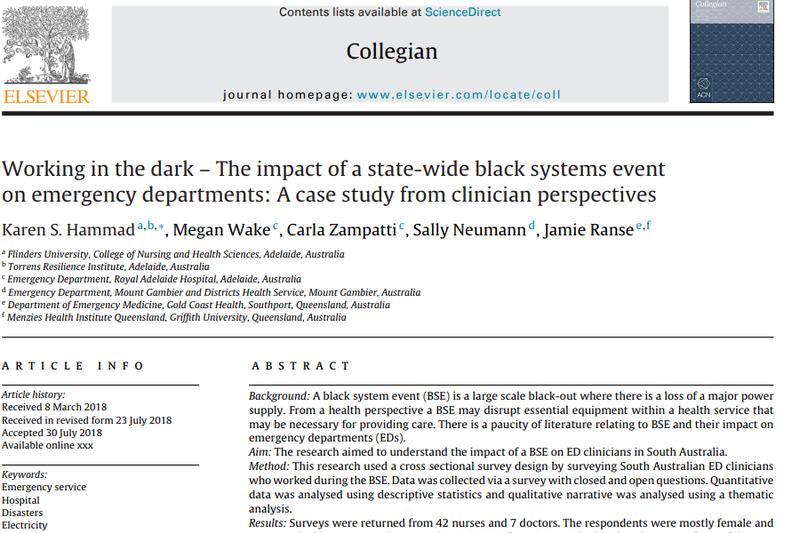 A lack of lighting radiography systems not working, communication systems not working and patient tracking systems not working were the most common ways the ED was impacted. Hammad K, Wake M, Zampatti C, Neumann S, Ranse J. (in-press, 2018). 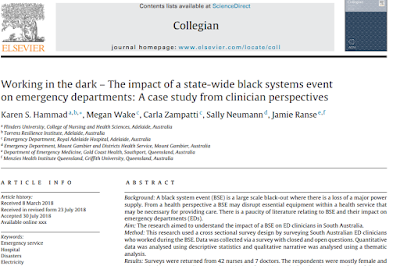 Working in the dark – the impact of a state-wide black systems event on emergency departments: A case study from clinician perspectives. Collegian. 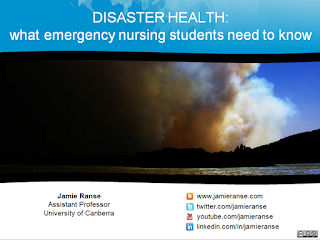 I was an invited guest speaker at the AusMed Education conference - Disaster Nursing - Not if, But when. 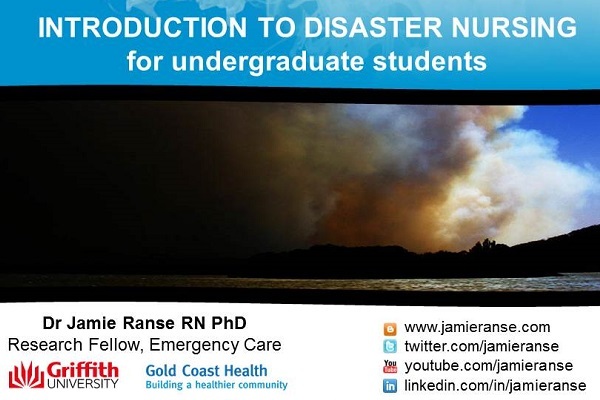 This presentation covers aspects of nurses education and willingness to assist following a disaster. 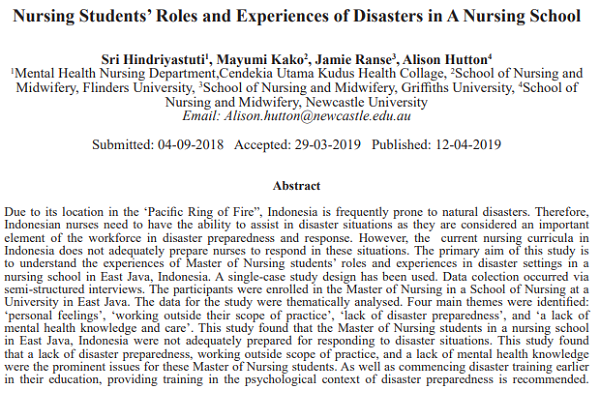 Furthermore, this presentation provides insight into a possible experience of what it may be like being a nurse following a disaster. I presented this work to the clinical staff of the Royal Adelaide Hospital, Emergency Department. 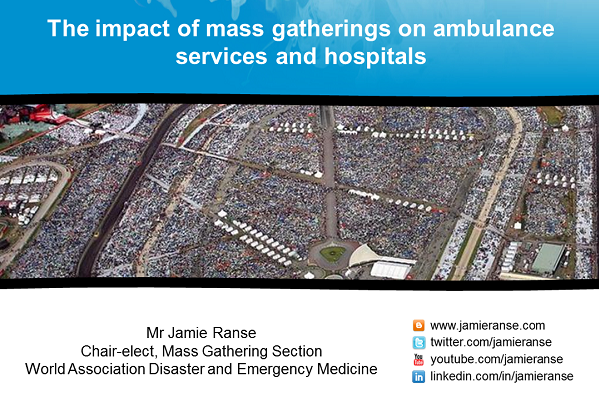 This presentation provided an overview of mass gathering event health-related topics. 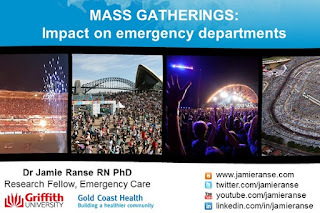 In particular, this presentation focused on the impact of mass gathering events on the emergency department. The discussion concluded with questions relating to the preparedness of the emergency department when mass gathering events are situated in the region of the hospital. This discussion explored factors pre, during and post a mass gathering. Background: In preparation for practice as a Registered Nurse, it is essential that students are equipped to care for the dying patient and their family. 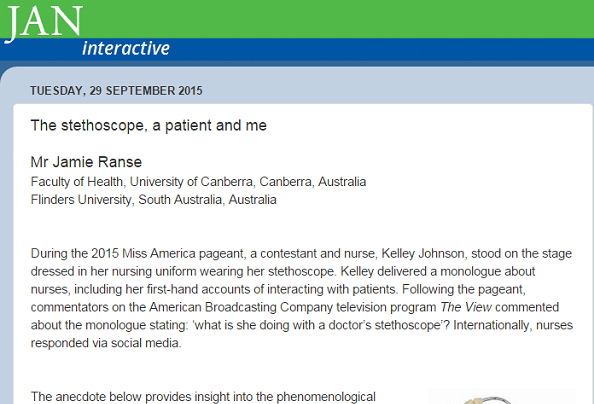 Aim: To explore nursing students’ lived experience of caring for a dying patient and their family. Methods: Students who had cared for a dying patient in their final year of study were invited to participate in an interview. Participants’ narratives (n = 6) were thematically analysed. Findings: Analysis revealed three themes: being caring, unexpectedness in witnessing an expected death and experiencing loss. Students demonstrated family-centred care but recounted unexpectedness in both the dying trajectory and physical changes in the dying patient. When reflecting on experiencing loss, students questioned their own actions, acknowledged the value of relationships and identified ways to cope. 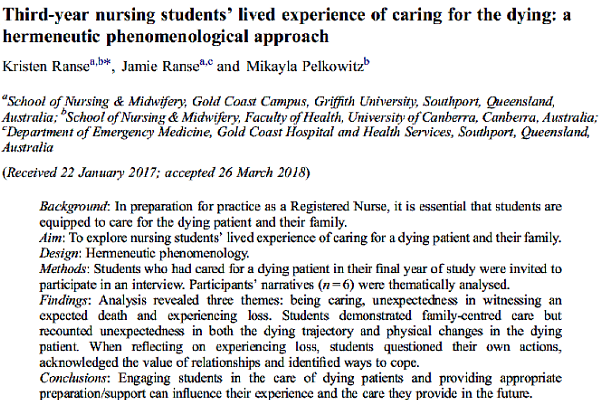 Conclusions: Engaging students in the care of dying patients and providing appropriate preparation/support can influence their experience and the care they provide in the future. Ranse K, Ranse J, Pelkowitz M. 2018. Third-year nursing students’ lived experience of caring for the dying: a hermeneutic phenomenological approach. Contemporary Nurse. [in-press]. This report identifies what is known about audience motivations at three different massgathering events: outdoor music festivals, religious events, and sporting events. In light of these motivations, the paper discusses how these can be harnessed by the event organizer and Emergency Medical Services. Lastly, motivations tell what kinds of interventions can be used to achieve an understanding of audience characteristics and the opportunity to develop tailor-made programs to maximize safety and make long-lasting public health interventions to a particular “cohort” or event population. A lot of these will depend on what the risks/hazards are with the particular populations in order to “target” them with public health interventions. Audience motivations tell the event organizer and Emergency Medical Services about the types of behaviors they should expect from the audience and how this may affect their health while at the event. 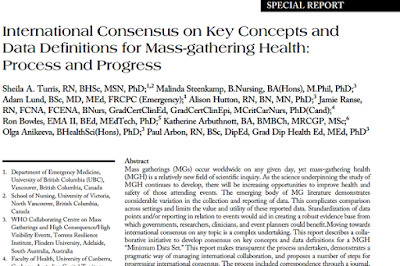 Through these understandings, health promotion and event safety messages can be developed for a particular type of massgathering event based on the likely composition of the audience in attendance. Health promotion and providing public information should be at the core of any mass-gathering event to minimize public health risk and to provide opportunities for the promotion of healthy behaviors in the local population. 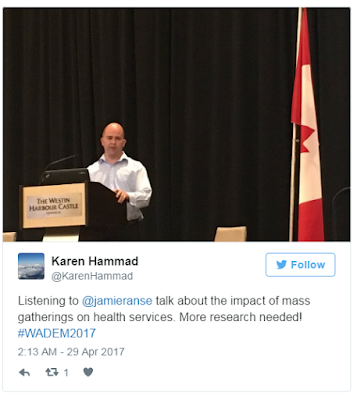 Audience motivations are a key element to identify and agree on what public health information is needed for the event audience. A more developed understanding of audience behavior provides critical information for event planners, event risk managers, and Emergency Medical Services personnel to better predict and plan to minimize risk and reduce patient presentations at events. Mass-gathering event organizers and designers intend their events to be positive experiences and to have meaning for those who attend. Therefore, continual vigilance to improve public health effectiveness and efficiency can become best practice at events. 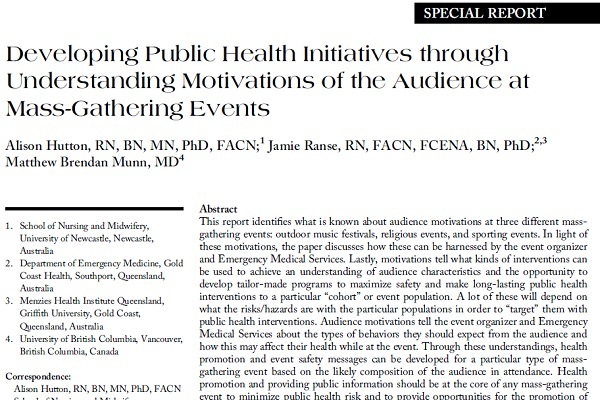 Through understanding the motivations of the audience, event planners and designers, event risk managers, and emergency medical personnel may be better able to understand the motivation of the audience and how this might impact on audience behavior at the event. 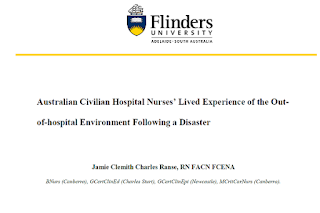 Study/Objective: This research explored what it may be like being an Australian civilian in-hospital nurse, in the out-of hospital disaster environment following a disaster, as part of a disaster medical assistance team. 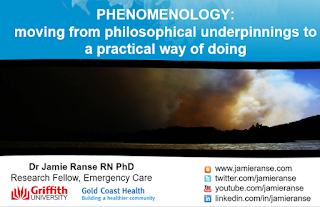 This presentation will explore the specific aspect of lived-space from a larger phenomenological research project. 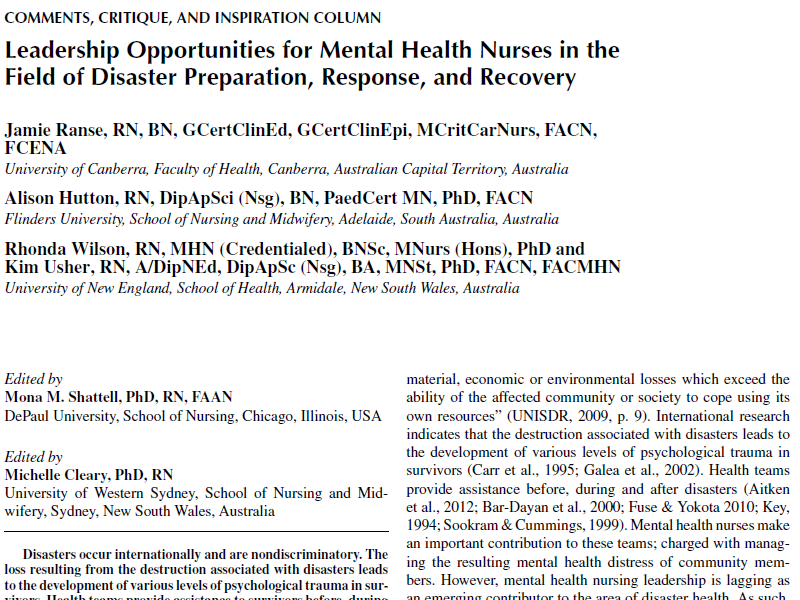 Methods: For this phenomenological study, narrative was obtained from eight Australian civilian hospital nurses following a disaster. Semi-structured interviews were conducted at two points in time. Descriptive moments of a possible lived experience were identified from participant narrative. These moments formed a lived experience description as an anecdote of an experience. 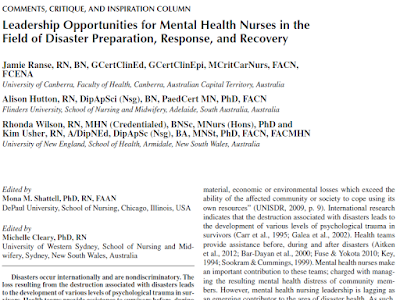 A preparatory epoché-reduction and reduction proper was used to guide a reflection on the lived-space of being a nurse, following a disaster from the lived experience description. Results: Lived-space was described as shrinking then being open too-wide, where nurses were drawn into the disaster lived-space, then returning home to a wide-open but crowded lived-space. Disaster health lived-space was described as occupying, sharing and giving back. 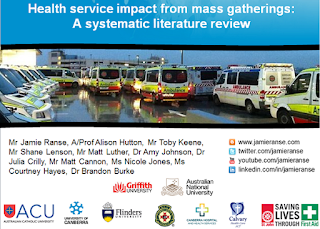 Conclusion: This research provides insight into Australian civilian in-hospital nurse in the out-of-hospital disaster environment, following a disaster as part of a disaster medical assistance team. In particular, this work adds a lived-space perspective to the existing literature. These insights may inform future education, research, clinical practice, and policy. 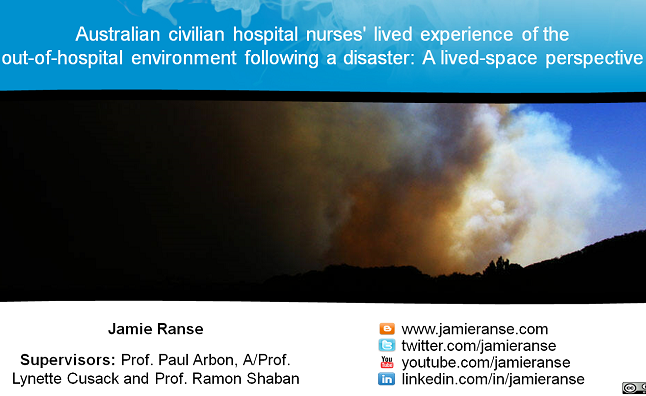 Ranse J, Arbon P, Cusack L, Shaban R. (2017) Australian civilian hospital nurses' lived experience of the out-of-hospital environment following a disaster: A lived-space perspective; paper presented at the 17th WADEM Congress on Disaster and Emergency Medicine. Toronto, Canada 25th April. I was interviewed by Chris Coleman on 1206AM Canberra 2CC regarding ways to keep people prepared for a disaster, from a health perspective. 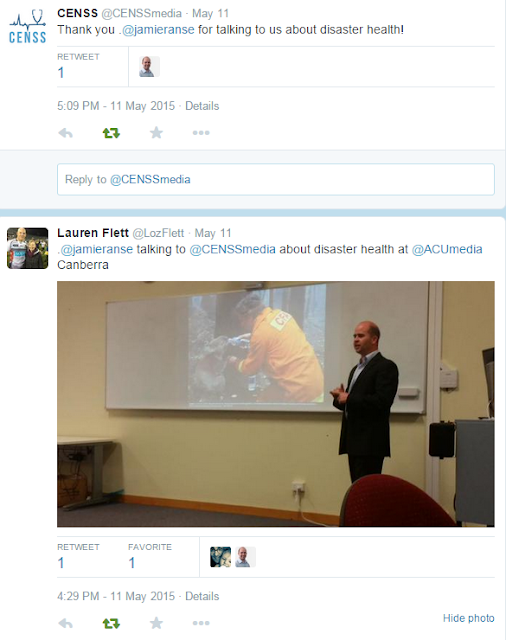 The interview was initiated on the background of impending hot weather and high fire danger in the Canberra region. On 18th January 2017, a number of large grass fires were burning in the Canberra region, resulting in emergency warnings for the region. I was interviewed by Chris Coleman on 1206AM Canberra 2CC regarding the immediate action people should take to keep safe and be prepared from a health perspective. 18th January 2017: Live interview, bushfire update ‘Considerations during evacuation’, on: 1206 2CC (Canberra). (During Bushfire Emergency near Sutton, NSW). Objective: This research aims to describe the effect of standard care (control) versus a clinical management pathway (intervention) on patient length of stay and admission rates during a public health emergency at one Australian Emergency Department. Method: A retrospective audit of hospital records for patients who presented in May 2013 with gastroenteritis-like symptoms was undertaken following a surge in patient presentations from a Salmonella outbreak. Patients who presented with gastroenteritis-like symptoms between 15th and 19th May 2013 received care according to a clinical management pathway (intervention). The focus of the intervention was based on symptom management, including a standardised approach to analgesia, anti-emetics and rehydration. Patient characteristics, such as age and gender are described using descriptive statistics. A Mann-Whitney test was used to compare continuous data and a Fisher exact test was used to compare categorical data, between the two groups. Results: Over an eight-day period, 110 patients presented with gastroenteritis-like symptoms. The median length of stay was statistically different between the two groups (P< 0.001). More patients were admitted to hospital from the control group (n = 5) when compared with the intervention group (n = 0); however, given the small number of patients in these groups, inferential statistical analysis was not a reasonable consideration. 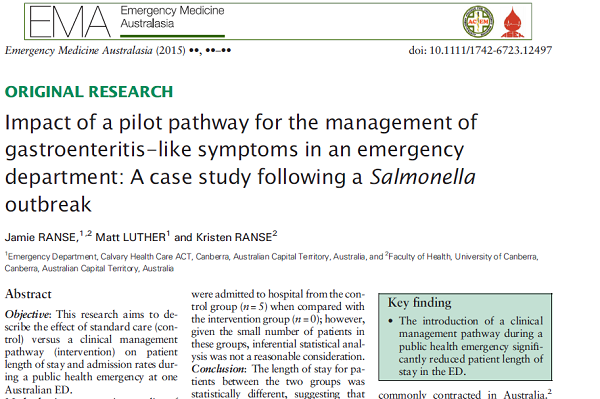 Conclusion: The length of stay for patients between the two groups was statistically different, suggesting that the implementation of a clinical management pathway for patients with gastroenteritis-like symptoms reduced the ED length of stay. This finding is useful in future planning for similar public health emergency responses and/or for use when patients present with gastroenteritis-like symptoms on a daily basis. Ranse J, Luther M, Ranse K. (2015). 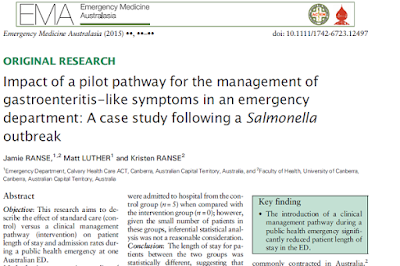 Impact of a pilot pathway for the management of gastroenteritis-like symptoms in an emergency department: A case study following a Salmonella outbreak. 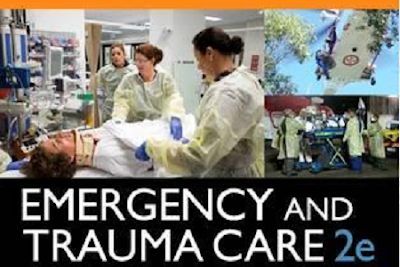 Emergency Medicine Australasia. [in-press]. The anecdote in this manuscript is taken directly from my thesis. 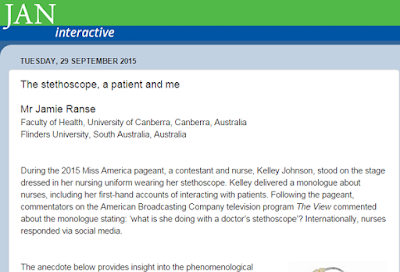 The anecdote provides insight into the phenomenological natural attitude of the stethoscope and what it may be like to experience a stethoscope as a nurse or as a patient. 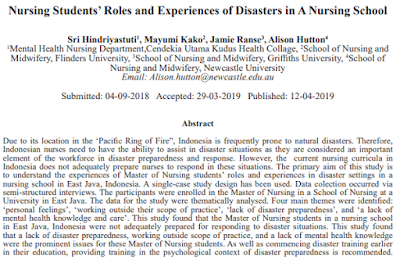 I presented on the topic of disaster health, with a particular focus on an Australian perspective, to students and faculty staff of the University of Santo Tomas, Philippines. Ranse J. (2015). 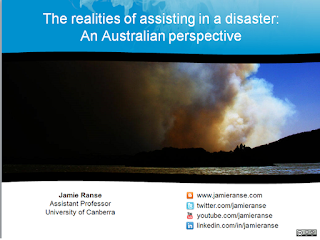 The realities of assisting in a disaster: An Australian perspective; presentation to Student and Faculty staff of the University of Santo Tomas, Philippines, Canberra, ACT, 3rd June.